unfortunately the person who did them for me about a year ago has stopped listing his custom cards on ebay and hasn't responded to emails. I think he did a great job--they are crystal clear images (he somehow airbrushed out the calendar holes for hanging as well) and printed them on normal semi-gloss (normal) cardstock. I think he charged me about 50.00 for the set of 26 and i was very pleased. I agree with you, a lot of collectors might enjoy a set of these at (or near) that price. I would pay $50 in a heartbeat. 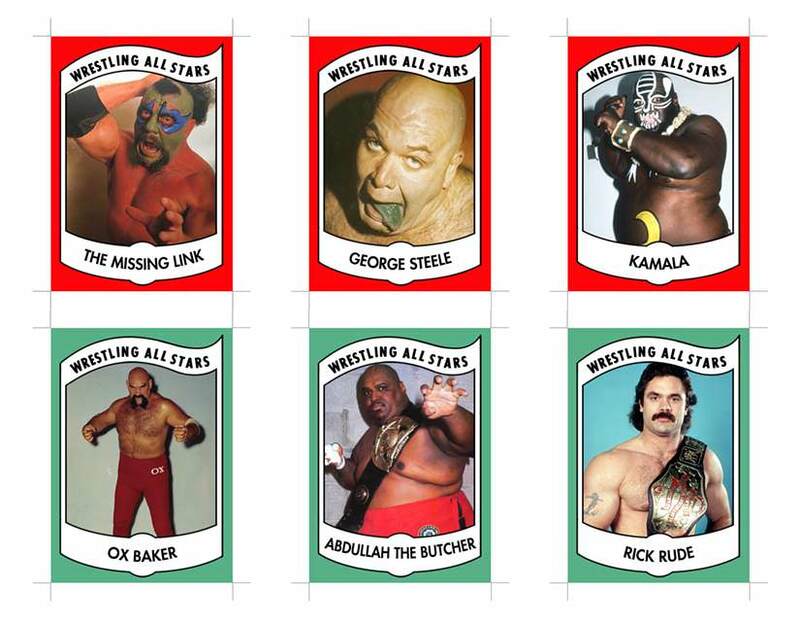 I snoozed on a custom set of Mid South Wrestling cards a few months ago and wish I hadn't. These would be perfect to get signed and submitted to PSA in a blue flip as a trading card. The only issue I see is if Brian who bought out Norman Keitzer would be okay with it. He owns the rights to it all. Seems like this is the thread for all 1982 Wrestling cards questions. 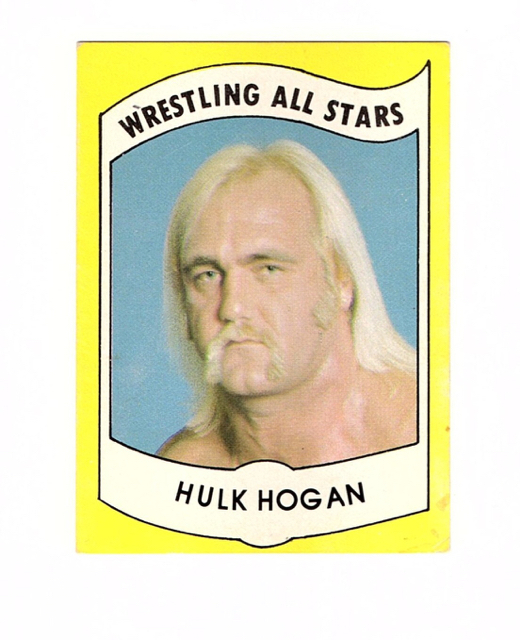 I found this Hulk Hogan in a box of old cards recently. I have it up on ebay but wanted a realistic value and what grade could I possible get if I submitted it to psa? Thanks! Unfortunately the damage to lower left corner on the reverse is quite severe. I think it would grade a PSA 2 and at most a PSA 3. In my view you are better suited to sell it raw and either a person who just wants a copy buys it or perhaps someone wanting to get it signed. With wrestling cards sometimes confirming the low grade hurts the value. I think in a PSA holder no more than $75, and out you might get as much as $150. To achieve high grades you need near flawless corners. Your Hogan presents well on the front with solid centering and no print dot which will help. I think Mr. Peck is spot on. Not to be mean, but there is no way that is anything close to a $500 card. Wrestling All-Star Hogans keep moving higher in value, but Hogan PSA 8s can still be had for less than $500. Thanks guys! I really appreciate the info. I'm not educated in wrestling cards so I wasn't 100% sure. The $500 was just a starting price, not necessarily what I was expecting to get out of it. I figured you've never know with eBay but that's why the BO is there. If I find more, I'll put up more scans. 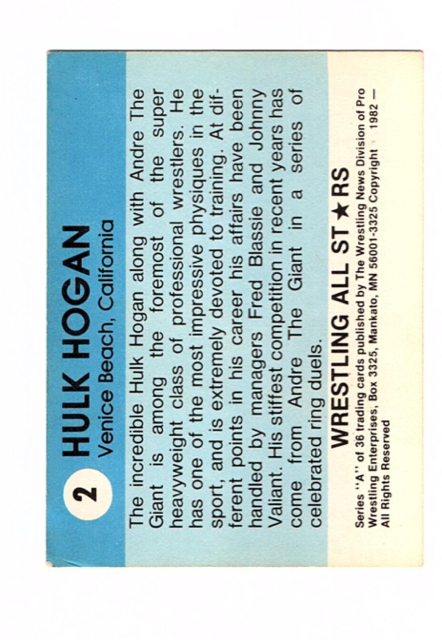 The Hogan Wrestling All-Stars card is one of the cards that I follow. Just for reference, here are most recent auction sales of the card in PSA 8 and PSA 7. I may have missed a sale here and there, but not many. PSA 8 (going back to December 2015): $568, $512, $363, $401, $307, $356. PSA 7 (going back to December 2016): $161, $200, $225, $155, $157, $182. I don't really follow anything below PSA 7 for that card, but I remember a PSA 6 being a little over $100 at auction for that card. Hey gang. I tried my hand at what the "next" series of cards might have looked like. Still finishing up the backs, but these are the fronts. I think I got everybody that I should have.. Any exclusions? Anyone there that shouldn't be? I'm going on the presumption that these would have been issued in 1984. Last edited by scott6649; 01-28-2018 at 09:09 AM. Well done, but just wondering why you added Putski and Morales when they already had cards in the series? Don't know how I missed that one. Or that the other two were already in there. Thanks! The original Sheik, Steve Williams, Magnum TA, the original Mr. Wrestling, and Buddy Roberts would be awesome additions as well. Last edited by wrestlingcardking; 01-28-2018 at 06:26 PM. nice--are you going to offer any for sale? Magnum TA. Thats a good one. I guess it's all in how deep you want to dig. A second series could certainly be doable. If you decide to make sets please let us know. I would be interested. Those are amazing, thanks for sharing! The last Bruno 9 went for more in a straight auction but nice to see this copy last less than 24 hours on EBAY. I have always thought that the Bruno card was undervalued and deserved more attention. I went and checked my registry and was pleasantly surprised. I forgot if I had two or three and it's three! The only 10 was self subbed by me so definitely a favorite. Last edited by Dpeck100; 01-30-2018 at 05:58 AM. First of all, a big thank you to the a**holes over at PhotoBucket for ruining this thread (and millions of others). I was born in 83' and started watching WWF towards the end of that decade, however, I was too small to understand and appreciate it. That didn't start until I was around 9 years old. The first wrestler to drive me nuts was the 1-2-3 Kid. I read in a magazine that he was a Tae Kwon Do expert and I was also enrolled in martial arts classes at that time. There were many other ways I identified with him. Now I have always been interested in wrestling cards, but have never made any moves. Unfortunately, the cards manufactured in the 90s aren't worth sh*t, so I'm not going to waste my time going after them. 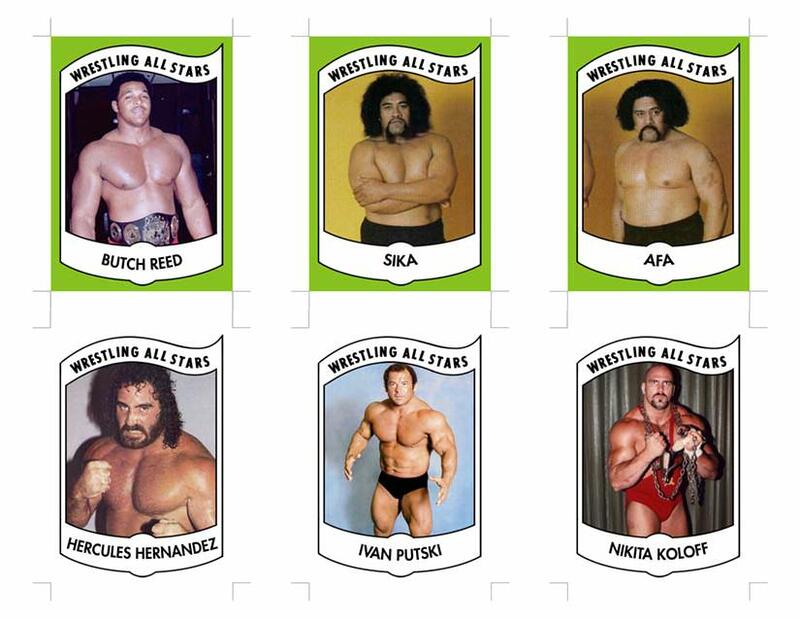 I am leaning towards buying the 82' Wrestling All-Stars set, especially because I want the rookie cards of Ric Flair and Hulk Hogan, but there are a few things that are bothering me: it looks to me as if these cards aren't really going anywhere price-wise. For example, the Hogan in PSA 9, which is probably the most popular wrestling card out there, has been stuck in the 2000 - 2500 range over the past few years. Compare that to PSA 9s of popular athletes from other sports; these cards have doubled, tripled or even quadrupled in value. Another issue is that most of the wrestlers featured in this set are people that I have never even heard of. Anyhow, I will keep my eyes open and when the right time comes I'll pull the trigger. Stormy weather today in Orlando. Spent some time looking through my cards and wanted to know the exact amount of Andre’s I own. 18 ranging from PSA 6 to PSA 9. Edit: No clue why the pic is posting sideways. Posting from my phone. Last edited by Dpeck100; 04-15-2018 at 07:00 PM. RIP Bruno. A true wrestling legend. great cards guys! I've always wanted an andre the giant!!! Thanks for checking out the thread and the comment. The Andre card is a great one! It pictures him winning the NWA Tri State Tag Team titles with Dusty Rhodes from the Super Dome Wrestling Spectacular Show on December 25th 1978. Andre was really in his prime at the time. 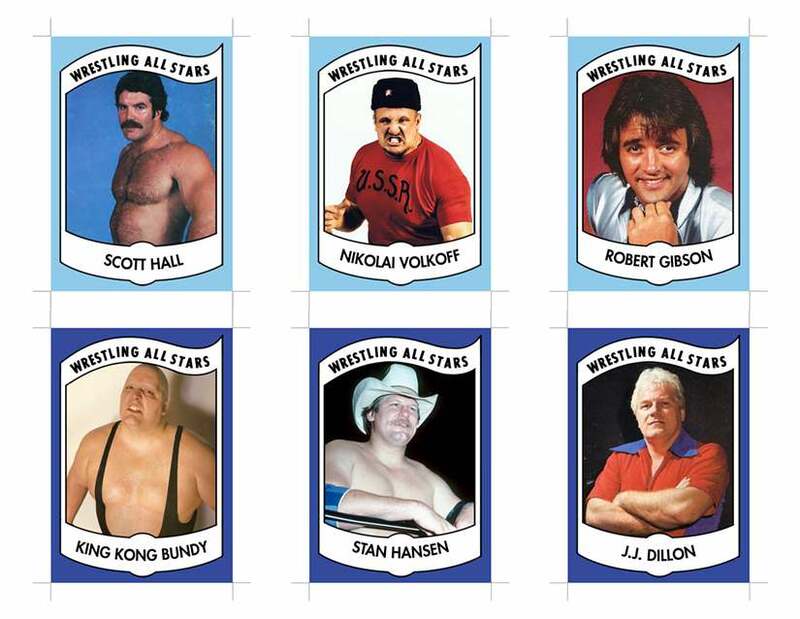 Here it is in a Wrestling News publication where they took their photos and used them for the trading cards sets they made. Last edited by Dpeck100; 04-23-2018 at 02:22 PM. Was glad to find this thread. For the last four years or so, I've only collected pre-war cards. Big wrestling fan and decided to try my hand at collecting some high grade first cards of wrestlers, including modern ones. 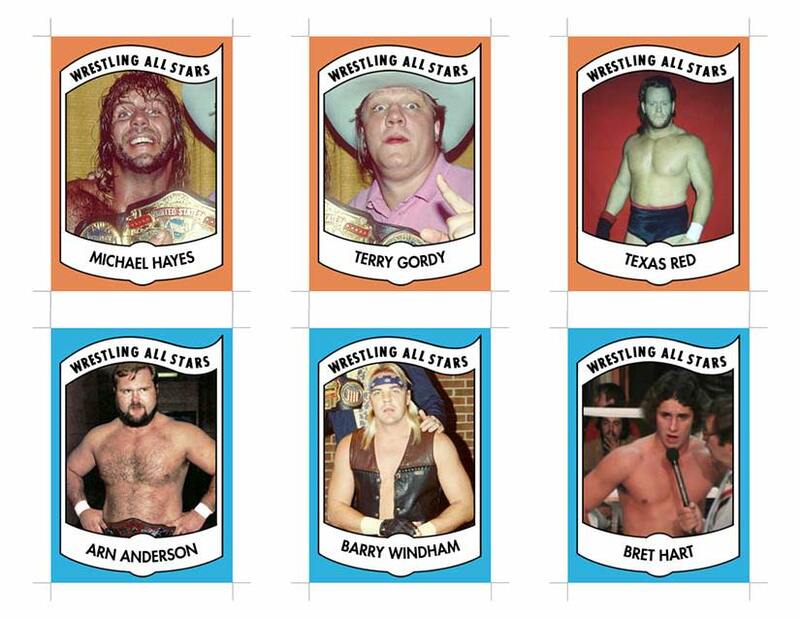 Also want to put together a fully-graded PSA 1982 and 1983 Wrestling All-Stars set. I started with a few today and somehow wound up with 16 so I went a little overboard. Bought mostly 7s and 8s but got a 9 or two. I'd love to get an Andre the Giant and am going back and forth between his 1973 magazine cutout and one of the 1974 Yamakatsus. I personally think the cutouts aren't really cards (even the magazine calls them 'wallet-sized photos' as opposed to trading cards, which they did for the larger ones in 1981, ironically). But I am surprised at how well the cutouts have been doing and they do seem to be respected as 'cards.' I'm a little torn because I'd like Andre's first real card but, man, I'm hard-pressed to call the cutouts cards. I got the 1973 annual Andre the Giant in a PSA 10 and I also have the 1974 Yamakatsu Andre the Giants in PSA and those are the first pack issued cards. Good luck on whatever you decide. I may be selling what you are looking at. i probably have some graded all stars that you may need as well. Not looking for too much for them, I just upgraded over time with them. I just noticed your name on some of the listings on eBay - you have some really great stuff. Let me take a look at your listings and message you. The 1955 Buddy Rogers card you have is impressive. Last edited by Cozumeleno; 05-04-2018 at 08:52 AM. Good luck in your quest to complete a graded set. This auction is a good one in my opinion. I think the opening bid is fair and the seller is a good one from Japan. I was skeptical early on about the 1973 paper cards but to Rob's credit they have done extremely well once graded. You routinely see cards sell for solid prices. I have always wondered if the buyers realize what they are getting before in hand but the trend continues and they move. Personally I prefer hard stock cards so the 1974 Yamakatsu I posted is your best choice for an early Andre if that is your preference. I think the reason they are treated as cards is they are numbered and in later years referred to as trading cards. There is such limited material that was released in the US during that time frame so it is good that collectors have an offering that has images that show case the wrestlers from those years. I personally prefer the 1982 Wrestling All Stars Andre over all of his other issues but once again that is a personal preference and it is fair to say I am biased because I own so many. Last edited by Dpeck100; 05-04-2018 at 12:12 PM. Thanks, David - I saw it shortly after it was listed and am keeping an eye on it. Appreciate the insight on the seller. In browsing numerous forums, I see your name as well as Rob's pop up frequently so glad to see you both active here as you both obviously know quite a bit. This is really a side thing for me right now but I'm focusing on high-grade PSA rookie cards. I still actively watch wrestling so I'm even buying recent ones with as long as the populations aren't high. While you're here, I think I noticed in a thread that you mentioned picking up a lot of high-grade Macho Man 1985 OPC rookies. Had you submitted any of those for grading? The post may have been an old one, I'm not sure. I recently bought this PSA 9 off of eBay and, while I believe I overpaid on it, was something I desperately wanted. Many of the high-grade Savage cards I've seen have been designated as OC by PSA and nothing is above a 9. Currently, there are only two of them. About 40 have been subbed and more than half have come back as OC. I'm sure more non-OC cards are out there, obviously, but that seems to be a problem with that card. Was wondering if you'd noticed that with other cards in the set. I have indeed submitted a handful of the Savage cards but have only submitted one of the Savage Attack card and it got a 7. That is a very tough card in a 9 with the vast majority of the cards horribly off centered. I look every day at the completed sales of PSA graded wrestling cards and looked at that one earlier. I don't think $75 is to high. It has been probably five years since I submitted the first PSA 10 of his card with Elizabeth. I love that card! The OPC set has a good number of cards with poor centering. Some are easier than others. Arguably the toughest card to find centered from any wrestling set is the King Kong Bundy from the OPC set. Hercules Hernandez is also a very tough to find centered card. Never seen one of either. 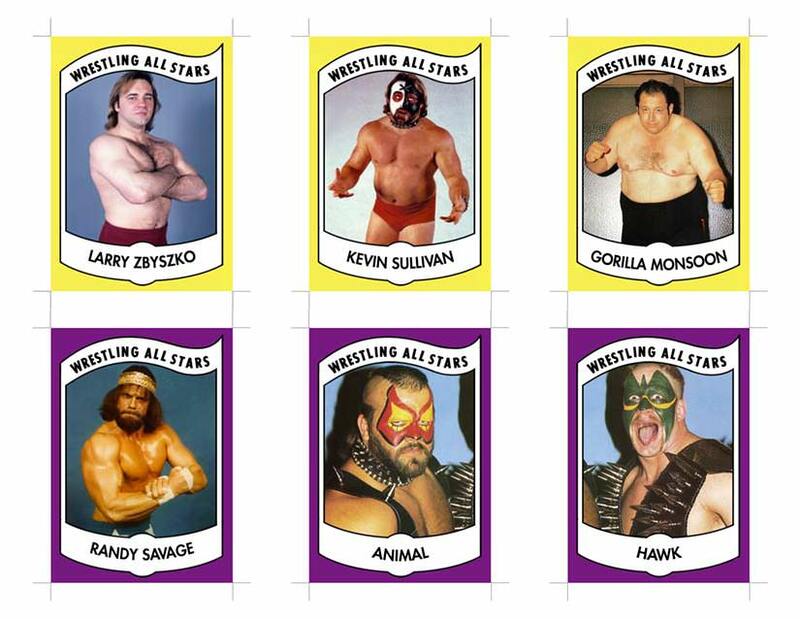 The 1982 Wrestling All Stars Series B Ray Stevens is another impossible card to find centered. Here is my OPC set. I for the most part only collect the base cards graded and not the skits. The Bundy card has the best centering I have ever seen on one and it isn't perfect. Last edited by Dpeck100; 05-04-2018 at 02:37 PM. Thanks for the insight. That's a great OPC set. I didn't think the Savage was outrageous but thought it might be a little high. Seemed like a tough card, though, and the OPC Macho Man Attack card was one of the first ones I wanted. I noticed a handful of 10s of the card with Liz in the pop report and hoping to get one of those at some point. Would love to pick up a 1974 Andre next as well as a high-grade 1989 Market Scene Rockers/Shawn Michaels, but only two of those have been graded and none highly. Rob was fortunate enough to help me out a little on his Buddy Rogers 1955 Parkhurst a little earlier today and with the eBay discount today, I had to have it (Thanks, Rob!). The Market Scene cards are very tough in high grade. One of the 8's of the Rockers is mine. Defiantly trying to upgrade that card. That's awesome - great card. I didn't even see any 8s. The pop report lists two different No. 9 Rockers cards and the one I was looking at showed only a 3 and a 5 graded. That's what I was referring to when I said there were no high-grade ones. But I see the others now. I bought one Raw off of eBay today - only one I saw. The picture was really grainy but it doesn't look high-grade at all. Still, I was just happy to get one for now. Finally got a chance to scan these. Awesome cards! Your set is coming along nicely! I definitely want to get a few more cards from the set. Last edited by Dpeck100; 05-05-2018 at 07:46 AM. thanks for the compliment....the last five additions have been great in getting my overall number up on my ratings....I have a few 3s that need to go but some of these are very tough to find. The quest continues.....it has taken years just to get to this point. I have a lot of signed Wrestling All Stars that one day I will send in to PSA to get authenticated. I had pulled this from my stack as I thought it looked really strong but I found the minor issue it has and why it was in my raw stack to begin with. Great looking signed card though. One day I plan to have PSA examine this. I just don't have any interest in mailing it away and having it sit there for awhile. Here is the Wrestling News Championship Wrestling Magazine for the CWA where the Lawler photo was first published. This is a really cool supplement they did for this territory and it was Jim Cornette who took the photo and was responsible for the content submitted for publishing. Cornette has always been super high on Lawler and his place in wrestling history. It's been a while since I have listened to Cornette talk about Lawler, but Cornette has made the case previously that Lawler should be top 10 all time in terms of drawing power based on Memphis. Cornette has talked in the past about Lawler's feud with Andy Kaufman being on the very short list of greatest wrestling angles in the history of the sport, and that David Letterman was not aware of what was going to happen when the pair appeared on his show. It is unfortunate that an entire generation of fans know Lawler only for his cartoonish WWE work. Last edited by Bored5000; 05-07-2018 at 11:37 PM. As a kid growing up I used to head up to the newsstand and sit for hours reading the various wrestling magazines. I always saw pictures of Jerry Lawler and him ranked near the top of the wrestling world and always thought he was working in the minor leagues and if he was so great he would come wrestle in the WWF. Little did a young guy know that he was a ratings smash, a great worker, an awesome talker and a co owner making big bucks from the wrestling business. His commentary during the attitude era was simply amazing and he is a true asset to the wrestling business. He interacts with fans and you can tell he has devoted his entire adult life to wrestling and loves it. His card is lower pop in general and has really firmed up in price. One of the primary reasons I don't sell cards from my collection generally is I sold years ago a PSA 9 for $60 because I had a few others. Woops. This is one of my favorite cards. It is a Pop 3 but only 2 exist as one was crossed over in 2010 to BGS. There is a non wrestling collector who owns the other one and he got it many years ago for $56. Score! I was fortunate enough to buyout another collector who was building sets on the registry and purchased mine from him years ago for $250. Last edited by Dpeck100; 05-08-2018 at 01:40 PM. When I was a kid, I always talked my mom into buying wrestling magazines every month when I would go shopping with her. Some of the guys I never got to see as a fan living in the Northeast seemed larger than life in the Apter mags. One guy that really stands out as an example is Mil Mascaras. When I finally did get to see Mascaras in person a couple times, it was a bit of a letdown compared to how he was portrayed in the Apter mags. Once I was an adult and the Internet became a thing, it was revealing to learn that Mascaras was portrayed in such a way in the Apter mags because Bill Apter was a fan of his. It also surprised me at least somewhat how often I read online from people outside the Northeast how disappointed they were in seeing Bruno for the first time after reading about him for years in the magazines. Conversely, I found Dusty Rhodes to be every bit as charismatic and entertaining as the magazines portrayed him to be. Last edited by Bored5000; 05-08-2018 at 07:54 PM. The Mascaras card is very tough to find centered. This is the best example I have ever seen and when it got listed I said I have to win this one. Thankfully I did. The Crusher just became a Pop 4 and it has to be a beautiful example. Hopefully it comes to market. This card took me over seven years to land. Such a tough card.